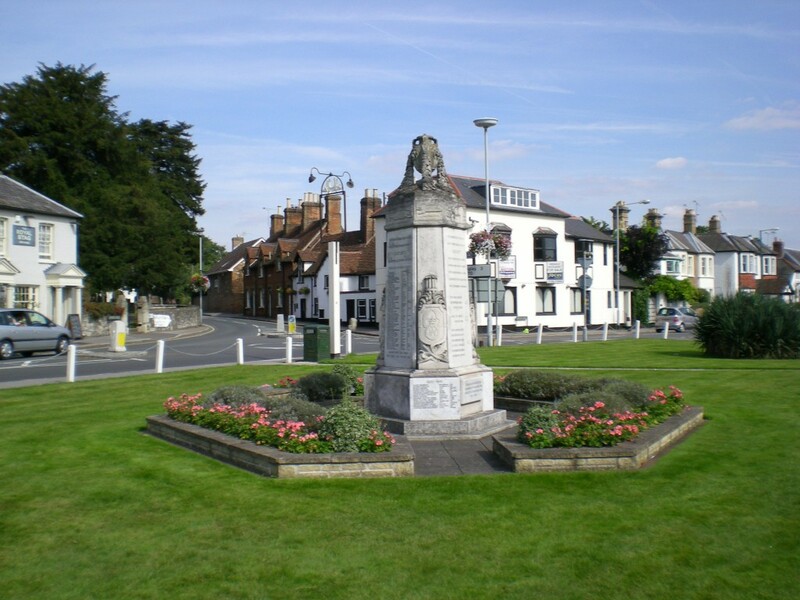 Datchet’s War Memorial was unveiled on 8th May 1920, but before that date two other First World War memorials were already in place. 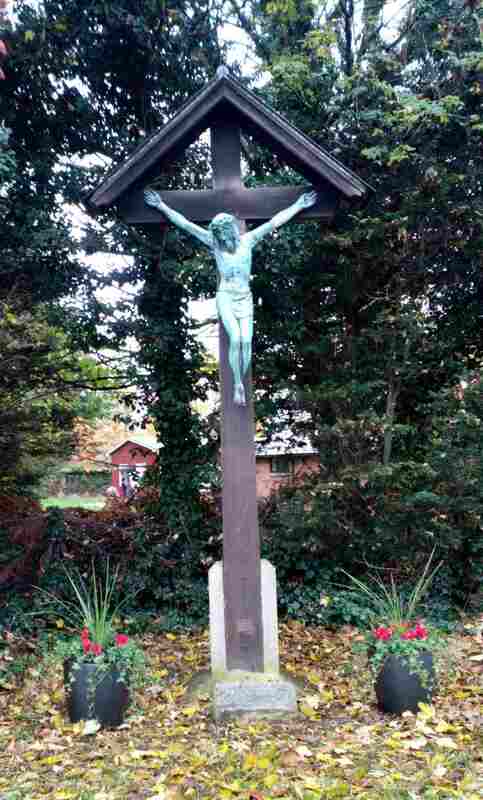 The first was the crucifix or wayside shrine in London Road, and the second was the Celtic cross just inside the boundary wall of the churchyard. 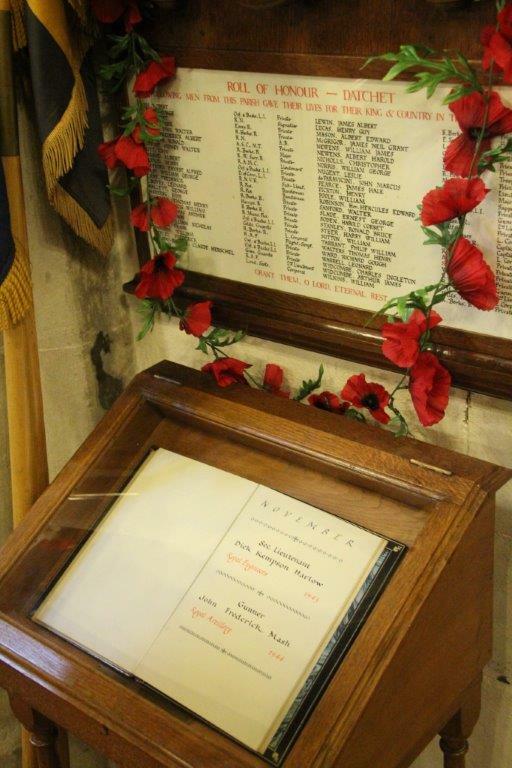 Finally, the names of the fallen were inscribed on a Roll of Honour displayed in the church. 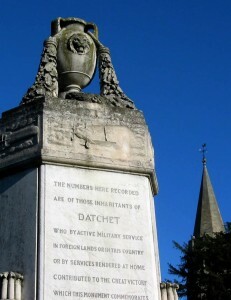 Datchet is unusual in having multiple public memorials, although additional private ones such as in churches and schools, exist in many places. 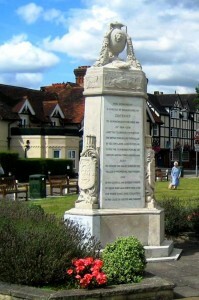 There was no similar national drive to raise memorials after the Second World War, and the names of those killed in 1939-1945 were eventually added to the obelisk on the Green in 1989 by the Datchet branch of the British Legion. These are on a separate plaque at its base. There was an air of intense expectancy until a phone message arrived to confirm the fact that the Armistice was signed and guaranteed official. The news spread swiftly on the arrival of a messenger from Windsor and flags and bunting were soon being put up while the church bells pealed. On Wednesday evening there was the largest congregation ever seen at the service in church. No doubt steps will soon be taken to have a permanent memorial to the fallen. At a Parish Meeting the building of a village war memorial was considered; a special meeting of the parish is to be called. 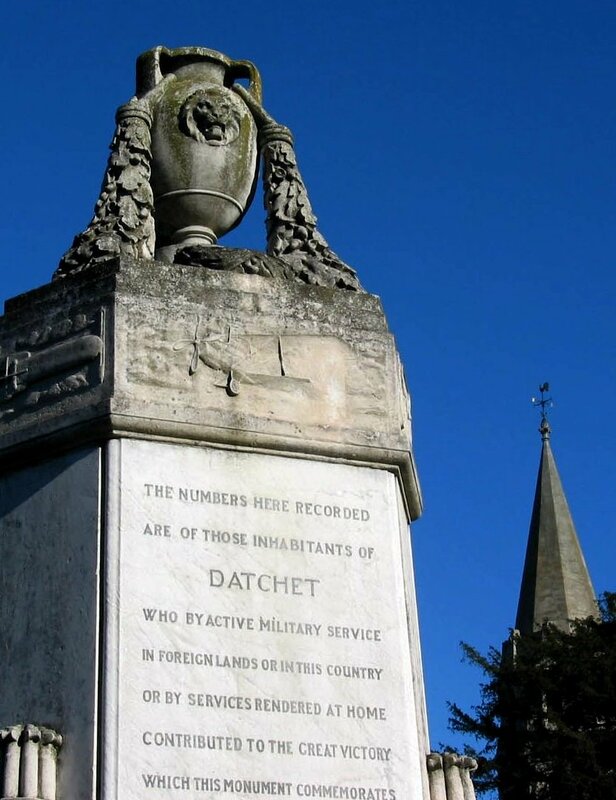 Many suggestions of other sorts of memorial have been made for Datchet: a Victory Hall, a recreation ground with a monument, endowed beds at the Edward VII Hospital, or a prominent clock. More suggestions included houses or flats for disabled servicemen or almshouses for old parishioners. A committee of the Parish Council is to consider the matter. This committee included Sir Lionel Cust who was later to design the memorial on the Green. 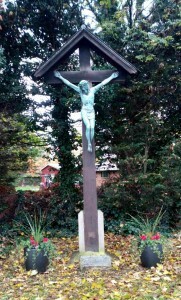 The entrance to London Road has been lately adorned by the erection of a ‘Calvary’ through the generosity of Mrs and Miss Curling of Denholme. 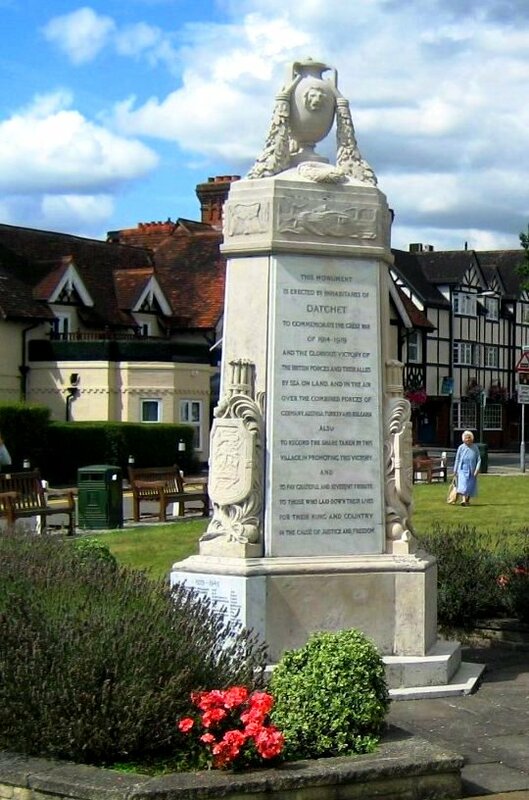 It serves a two-fold purpose, in reminding passers-by of the great sacrifice and of the sacrifice of so many of Datchet’s sons in the Great War. Denholme is one of the houses directly opposite the Library in Horton Road. Richard Curling served abroad but was not killed. On Empire Day a large congregation, including many soldiers returned from the front, attended the Dedication of the Crucifix. The procession started from the church with George Hunt carrying the processional cross, followed by the choir, the Vicar and the Bishop of Buckinghamshire. In his address the Bishop said that the memorial was intended as a wayside shrine which would be a familiar sight to those who had served in France but was little known in England. 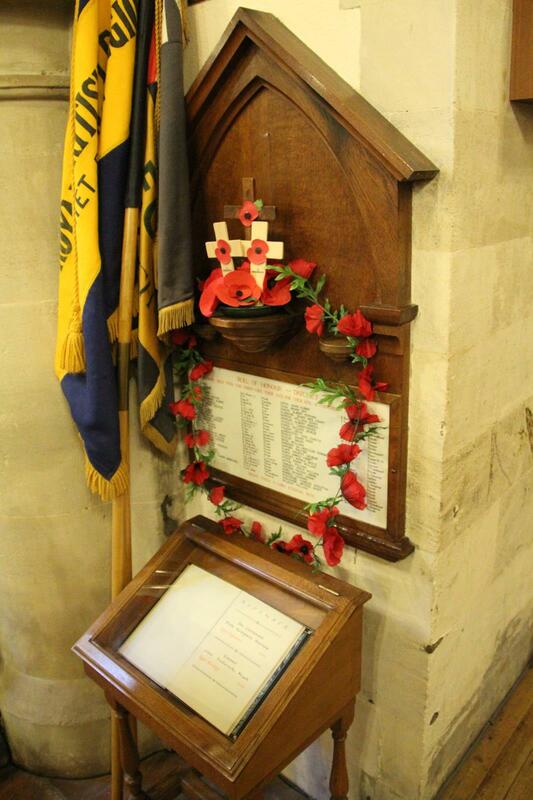 TO THE GLORY OF GOD AND IN MEMORY OF THE GREAT WAR 1914-1919. Mr Kinross, chairman of the Parish Council, had put up notices asking for silence, and at 11 o’clock a maroon exploded from the fire station by George Cleversley announced the start of two minutes silence. 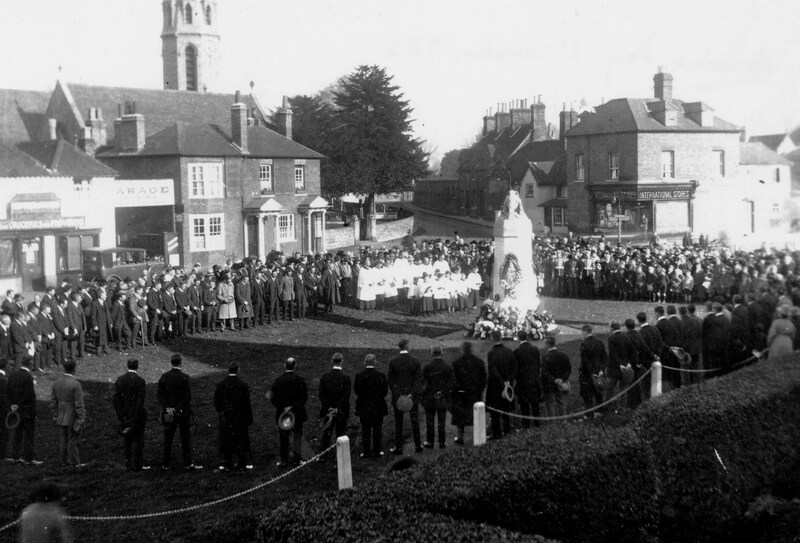 A floral tribute was placed at the foot of the war shrine in London Road by the women of Datchet. 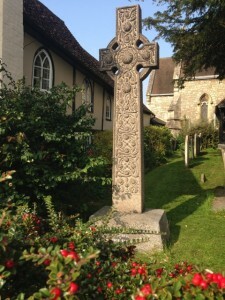 An application has been made for the erection in the churchyard of Datchet a Celtic Cross in memory of those from the parish who have fallen in the war. It is to be made from grey Cornish granite and is to be nine feet high. At last the Women’s memorial is making some progress now that the faculty for its erection in the church yard has been obtained. Meanwhile some improvements have been made to its design. £600 has been raised for the War Memorial fund. A design was placed before the subscribers at a meeting held at the schools, to which only two disagreed. It is hoped to erect it in the spring. Only four of the memorial committee of fourteen had lost sons (six between them) and all four represented wealthy and powerful local families: John Kinross, Henry Kelway-Bamber, Lady Marcia de Paravicini and Percy J de Paravicini. The Marquis of Lincolnshire, Lord Lieutenant of Bucks, unveiled on Sunday afternoon on the village green at Datchet, the handsome obelisk which has been erected there by the inhabitants as a memorial to those men of the village who fell in the war. The memorial, which was designed by Mr Lionel Cust of Datchet House, has been raised by subscriptions from all classes of the inhabitants and cost a little over £600. 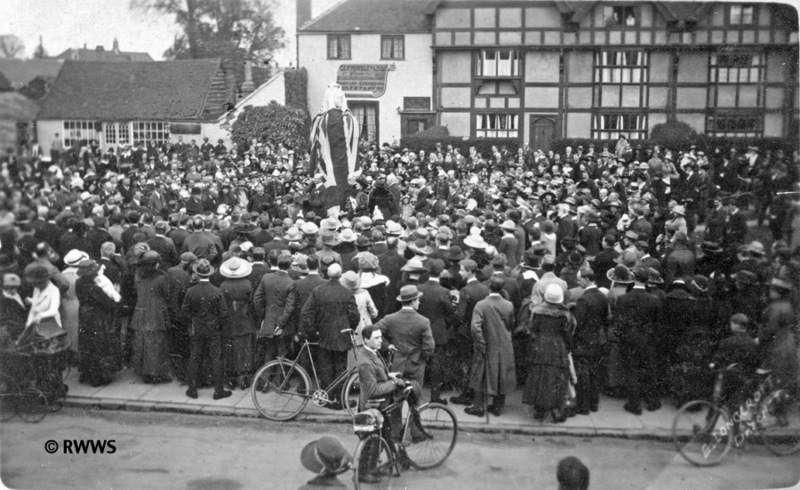 Most of the residents of the village were assembled and the schoolchildren, with their headmaster Mr E.W.Page, were given a post of honour near the memorial. The members of Datchet Fire Brigade were present in full uniform and formed a ring around the memorial. The demobilized soldiers were drawn up in lines along the main path, and on the arrival of Lord Lincolnshire he inspected the men, shaking hands with every one and asking particulars as to his service. Mr John Kinross, in inviting the noble Marquis to unveil the monument, delivered an excellent speech. Lord Lincolnshire, having unveiled the Memorial (which was enveloped in the flag of England), said that he could not help thinking how right people in this great and historical country were in not following the advice of those who wanted to have one great memorial in one common centre in the county. How much better it was that loving hearts had decided to set up memorials in every township and village of England.Afterwards, flowers were placed at the base of the Memorial by the villagers and the schoolchildren. The memorial was much admired. The exceptional design of this monument is due to Lionel Cust’s life in the arts, as Editor of the Burlington Magazine, Director of the National Portrait Gallery and Keeper of the King’s Pictures. For an idea of what the £600 might have meant at the time, Old Manor House (behind the memorial in the 1920 photo) had been sold in 1896 for £700. Maintenance: The memorial is the responsibility of the Datchet Parish Council since they ‘own’ it and it is on Parish land. In 2011 a thorough restoration was carried out and funded at the initiative of the Barker Bridge House Trust but on behalf of the Parish Council which had to approve the proposed work and place contracts. Previous repairs had also been undertaken by the Council. There remains now the Roll of Honour, inscribed on parchment, to be placed on the Shrines in the Parish Church and All Souls. I am ascertaining the probable cost of these. We have all been unanimous in this part of our Memorial and I hope that some of those who did not care to subscribe to the others will help us with donations towards the cost of these. All Souls was the cemetery chapel where C of E services were held as more convenient for people at Datchet Common than the parish church. Originally, there were fifty one names on the Memorial, but by the time the Roll was written the number had risen to fifty four. The Vicar’s comments hint at divided opinions in the village, most likely because money was being spent on monuments rather than on practical purposes. One copy of the Roll of Honour is still displayed in St Mary’s, in a glass case near the choir stalls. Adam Robert Pte Oxford & Bucks L.I. Ball Robert Pte Essex R.
Bonner Frank Pte R.Berks R.
Bettles John Walter A.B. R.N. Boxall Frederick Albert Pte A.S.C.M.T. Brakespeare Ronald Major R.Berks R.
Burfoot Sidney Walter Pte R.W.Surrey R.
Carrod Albert Pte Oxford & Bucks L.I. Carrod Henry Pte D. of Cornwall L.I. Clifford Ernest Alfred Sub-Lieut R.N.W.R. Groves Leonard Pte R.Berks R.
Hallett George Pte Hampshire R.
Harding John Pte R.Berks R.
Higgs Francis William Pte Oxford & Bucks L.I. Hutton John L-Corpl R.Berks R.
Jewers William Nicholas Flight-Sergt R.A.F. Johnson Frank Pte Oxford & Bucks L.I. Johnson William Pte Oxford & Bucks L.I. Kelway-Bamber Claude Herschel 2nd Lieut R.A.F. Lewin James Albert Pte R.Berks R.
Lucas Henry Guy Pte E.Surrey R.
Newens Albert Harold Pte R.Berks R.
Norris William George Pte M.G.C. Pearce James Hale Sapper R.E. Pickton Henry Pte Oxford & Bucks L.I. Sanford Walter Pte Bedford R.
Stanley Ronald Bruce Captain R.A.F. Steer Harry William Pte R.Warwick R.
Walters Thomas Henry Pte Wilts.R. Ward Richard Gough Pte R.W.Surrey R.
Widcombe Arthur James Lt Corp Wilts R.
Widcombe Charles Ingleton 2nd Lieut Oxford & Bucks L.I. Wilkins William Pte R.Berks R.